I don’t have a paying job at this time, but I am very busy. Even though I no longer homeschool and my girls are over ten, my house is messy. I spend most of my day on Facebook and Twitter. Christina, my daughter, is growing up in a world where no one invites her over to play. Children avoid her on playgrounds and at school. She has never been insulted to her face, but she certainly gets some weird looks. I imagine that some people who see her are happy that they don’t have a child like her; she is challenging, and, well, different. The main reason that I am on the Internet all day is to make the world a better place for her to grow up. Sometimes my work involves her particular circumstances, such as seeking out successful speech therapy strategies. Sometimes it involves investigating and promoting promising research, passing on inspiring stories or violations of human rights, but most importantly I strive to raise awareness in society that having a child with Down syndrome has an up side. Many of them. And these children have a right to be here, even if they didn’t have anything to give. Because we all know that those whom the world often rejects can be the best givers. Anyone who has heard me speak or read my blog knows I could go on for days about Christina’s good qualities: the way she has the best belly laugh in the world, gives the tightest hugs, and teaches her family about the true nature of love. I am hardly alone in these observations. 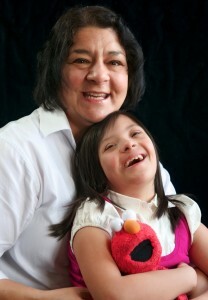 Most families raising a person with Down syndrome will bend your ear for hours with such talk. But the cold, hard fact remains, that when expectant moms find out they are carrying a child with Down syndrome, the majority (sources say anywhere between 75%-92%) abort them. And with new, non-invasive testing, the numbers are poised to soar. We may see nations who, via prenatal testing and abortion, virtually eliminate Down syndrome (which is not inherited, it occurs randomly) from their populations. Some, like Denmark, and possibly the US, see that as an advance. Eugenics is alive and well. It just looks neater than it did in the forties. So, a child with Down syndrome is seen by most people in society as bad news. And this mom, along with legions of other parents of kids like ours, want to fix that. But being a full time advocate doesn’t pay well. In fact, I barely make my travel expenses to sell my book A Special Mother is Born away from home. So I want to change society into one which accepts children like Christina, embraces them for who they are while supporting them as they develop and go out to achieve their life goals all the while making us better people. So what does this have to do with moving to North Dakota? Someday, we will come to our senses in America and ban all abortions, welcoming all children into life. My daughter will be accepted by her peers, and live life to the fullest. And I will finally learn to ski.